With the recent release of Liquidware Labs’ Stratusphere UX version 5.6.2, new enhancements were made to the Preview Inspectors Excel Export functionality. The Preview Inspectors provide a powerful interface to quickly search for and analyze the Stratusphere metric data that you need. With the excel export functionality you can now take that data offline to excel so you can do further analysis or for distribution and archive. You can export the Preview Inspector resulting data from any Tab or View available. If you are looking for machine, user, application or any of the other metrics and groupings that all work perfectly with the export function. First pick your tab and view for the data to be exported. Then sort and group the metrics you want and then click the Export link in the top left corner of the page. It is that simple. This will give the options to Export the resulting data selected. Choose Spreadsheet as the Export Method and select ‘Get ALL RECORDs’. This will take your metric results and build a new spreadsheet, which you can then download and save. Note: Current Maximum rows per spreadsheet are 99,999. One nice feature is the use of automatic intelligent file names when creating the spreadsheet. In this example we are working on the Summary tab for Machines using Today’s date. The resulting spreadsheet has a timestamp, as well as the tab and date selection information. You don’t have to be concerned with naming your spreadsheet, the Preview Inspector export does that for you. Once you have downloaded your spreadsheet you will see it professionally formatted with each metric column. You are now ready to work with your data further in the spreadsheet format. A very cool feature new in Stratusphere UX 5.6.2 and is automatically brought into the resulting spreadsheet is the help tool tips, that are available in the Preview Inspectors. If you hover over any column heading the tool tip will display as a spreadsheet comment providing metric help information. In this example we are looking at the ‘CPU Queue’ column. The Preview Inspectors are a highly customizable interface enabling the user to set their own preferences for working with their data in their desired output format. The Export function is just as customizable with a number of options that can be set. To open the window click ‘Show Options’. In the below example, a number of the Pretty Cell Options have been enabled. For example showing the unit of measure directly in each cell. Now it is very simple to indicate automatically that ‘App Load Time’ or ‘Login Delay’ as examples are measured in seconds. All of which makes for a formatted and user friendly spreadsheet of Stratusphere UX metric data that is ready for use immediately. 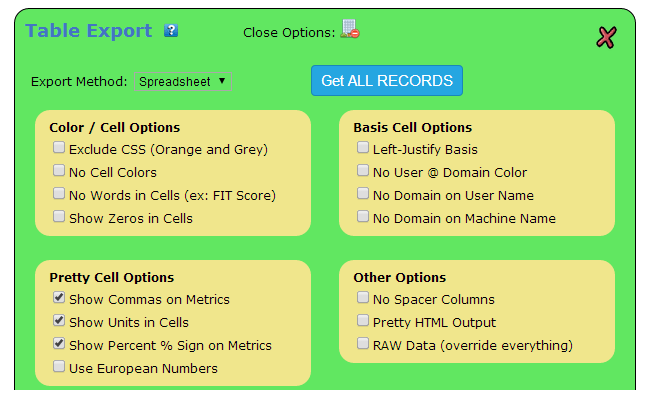 Stratusphere UX version 5.6.2 introduced the advanced export spreadsheet function. Going forward in future releases look for even more enhancements and improvements to the exported spreadsheets as well as the overall Preview Inspectors. For more information on Liquidware Labs Stratusphere UX visit the Stratusphere UX Product Page or contact sales at Liquidware Labs.